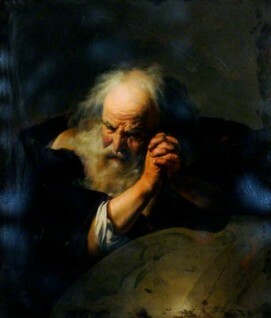 Museums Sheffield’s 'Heraclitus, Ancient Greek Scientist' was listed as by an unknown artist, when Bart Cornelis (of 'The Burlington Magazine') proposed a discussion about it. The painting showed the same composition as a work in National Trust, Knole, attributed to Dutch painter Johannes Moreelse (1603–1634). Tony Campbell indicated the painting at Knole could even be an inferior copy of Museums Sheffield’s work, and the model appears to be the same as his painting of Heraclitus in Centraal Museum, Utrecht – this painting could even be its pendant, as they are the same size. Group leader Tim Llewellyn indicated this to be an exciting discovery of a rare painter – it seemed clear the work was by Moreelse. The collection were happy for the painting to be listed as ‘attributed to’ Johannes Moreelse. They are planning to investigate further into whether the painting could have a monogram. Could this work be by Dutch painter Johannes Moreelse (1603–1634)?